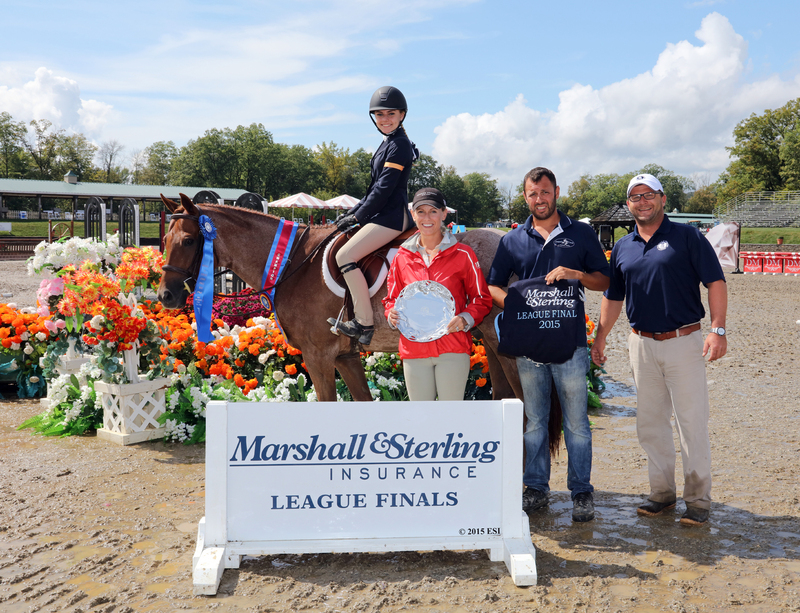 SAUGERTIES, NY (September 17, 2015): Show jumping competition at HITS Saugerties continued throughout the weekend with the Marshall & Sterling Insurance League National Finals. Featuring specialty classes in Children’s and Adult Hunter, Jumper and Equitation, these unique finals gave a deserving group of riders their moment in the spotlight. Julia Friedman and Pure Gold, owned by Alexa Friedman, ­­­gave a stellar performance worthy of a blue ribbon in the Marshall & Sterling 2’6” Child Medal Finals. Boasting scores of 84 and 85, for a total of 169, they shined amongst their competitors for the title win. Fifty-two riders took their chance over the round one course designed by Jerry Dougherty of Bokeelia, Florida. Testing the riders on their horsemanship skills, many competitors received scores in the mid-to-high seventies, except for just two riders – Friedman and Nicole Pietro riding Typhoon, owned by Mary Beth McGee – who received scores of 84 and 83, respectively. The top twelve returned for round two and competition started on a high note with scores in the eighties for the first three entries. Seventh in the order of go, Sophie Geslao aboard Contiko, owned by Windham Hill, LLC, cruised to the top of the leaderboard with a score of 85, which added to her round one 78.5, totaled 165.5. Things appeared to be in Geslao’s favor as the next three contenders attempted the course but couldn’t top her. Eleventh to give the round two course a go was Pietro and she navigated her mount to a score of 83.5 for a total of 166.5, just one point higher than Geslao, but good enough for the lead. Anchoring the order, Friedman did not disappoint. Finishing with a round two score of 85, for a total of 169, she claimed first, bumping Pietro to second and Geslao to third. Fourth place was awarded to Angelina Dielo and Flor Fulton’s As Good As It’s Get, followed by Hanna Clark and her own Out of the Blue in fifth place. Teagan Long and Angelique, owned by Andrew Ross, emerged victorious in the Marshall & Sterling Junior Medal Final after receiving consecutive top scores of 81 and 85 for a total of 166. Sam Beiter and her own Cool Water finished in second with scores of 79 and 70 for a total of 149. Following in third place was Charlotte Kwon and Donald Stewart’s Skrillex who received scores of 75 and 65, totaling 140. Gabrielle Baker piloted her own Mirror Image to fourth place with scores of 60 and 75 for a total of 135. Julia Liverton and her own He’s All Mine rounded out the top five with scores of 25 and 60 for a total of 85. Teagan Long and Angelique on their way to a Marshall & Sterling Junior Medal Final win. Grace Saad and Amendment 15, owned by Darren Chiacchia, finished first in the Marshall & Sterling Junior/Amateur Horsemanship Final. The two-phase class featured round one over fences with the top twelve returning for a test of the flat. Saad took home the high score of 86 and held onto the top spot on the flat to take home the blue ribbon. Second place was awarded to Hannah Matts and La Congo, owned by Abby Heffern. They received a round one score of 83. Matt Lowe and Redfield Farm’s Calvino scored a 78 for third place, followed by Taegan Long and Angelique, owned by Andrew Ross who had score of 70. Notably, Long was in seventh place going into the flat, but her work impressed the judges and moved her up the leaderboard to fourth place. Kylie Harvil and her own Quick Silver had received a score of 75 over fences, but due to Long’s top-notch flatwork, Harvil was bumped to finish in fifth place. Grace Saad and Amendment 15 on their way to a Marshall & Sterling Junior/Amateur Horsemanship Final win. 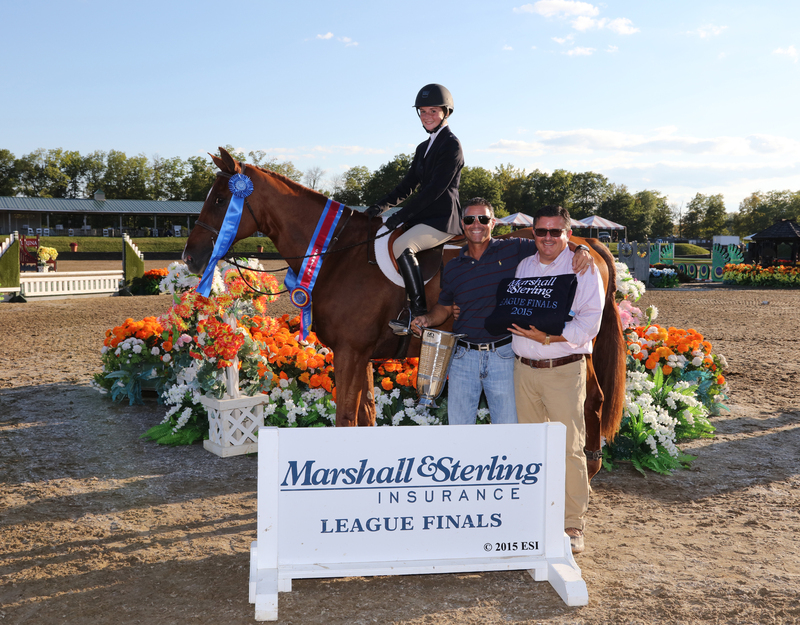 Lucas Mejia Fenjul and Champlaine Celebration, owned by Lauren Reid, were crowned the Marshall & Sterling Children’s Pony Medal Final – Small/Medium winners after receiving scores of 84 and 95 for a total of 179. Thirty-nine competitors attempted the 11 fence course set by Dougherty and all had intentions of going home with the blue ribbon. The top 12 returned for a second round, testing their mounts over an abbreviated course but it was the eighth entry of the order that got the show on the road. Isabel Massart rode Hopscotch, owned by Jody Moraski, to an impressive score of 90. Added to her round one score of 82, it gave Massart a total of 172 for the lead. Ready to chase Massart for the top spot, Fenjul, who received a round one score of 84, entered the ring eleventh in the order. They finished their trip and received the round high score of 95 to take the lead. The final entry of the day was Blu Venture Rainbeau owned and piloted by Alexa Lignelli. After receiving the round one high score of 85, Lignelli was ready for a win, but her round two score of 92 and a total of 177 would place her just behind Fenjul in second place and in front of Massart in third. Fourth place went to Mia Curtin and Rhyme N’ Reason, owned by Affari Horse Farm LLC. Jessica Guginsky rode her own Sunkissed to a fifth place finish. Lucas Mejia Fenjul and Champlaine Celebration take the Marshall & Sterling Children’s Pony Medal Final – Small/Medium. Of the 44 riders in the Marshall & Sterling Children’s Pony Medal Final – Large, Ava Caputo and her own Autumn Frost came out on top. The Lloyd Harbor, New York native received scores of 90 and 88 for a total of 178 to bring home the blue ribbon. It was clear that after a competitive first round in which many received scores in the eighties, a true battle of the best would ensue in round two. Ninth in the second round order was Christina DeMattheis and her own Sir Harvey, who received a round one score of 83. In sync throughout the trip they received a score of 84 in the second round, totaling 167 for the lead. Next to give it a go was Woodland’s Gardenia, owned by Elizabeth Garcia, piloted by Madeleine Flocks. After having received a round one score of 84, they were confident in their craft, but a round two score of 82 gave them a total of 166 to finish one point behind the current leader. Eliza Altman and Versace, owned by Lynn Edens, chased DeMattheis for the top spot and did just that. Receiving a score of 87, added to their first round 89, totaled 176 for the lead. Caputo and her mount were the last entry of the class and in perfect harmony, found themselves with a round high score of 90 for a total of 178 and the win, bumping Altman to second, DeMattheis to third and Flocks to fourth. 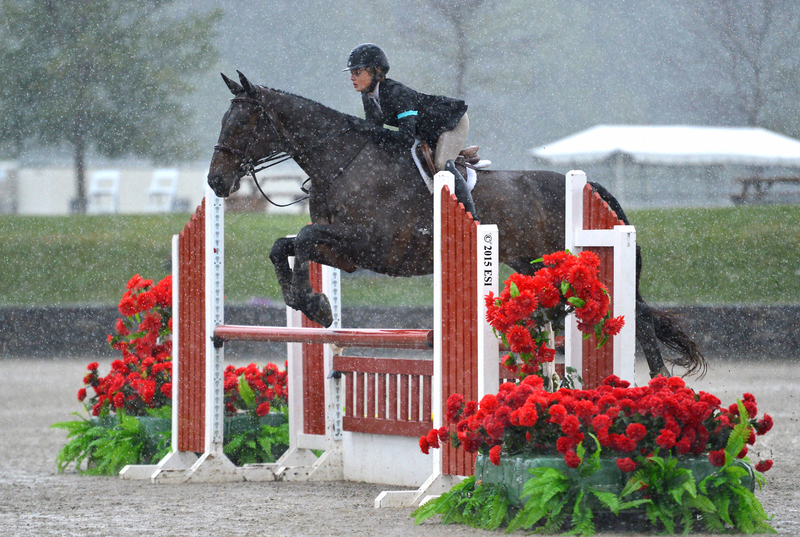 Fifth place was awarded to Lucie Showalter and Picturesque Decade, owned by Joanne Showalter. Ava Caputo and Autumn Frost were all smiles after winning the Marshall & Sterling Children’s Pony Medal Final – Large. Francesca DiGuglielmo and Coolidge, owned by Redfield Farm, took home top honors in the Sore No-More Children’s Medal Final – Horse with scores of 80.5 and 83 for a total of 163.5 after besting a field of 72 competitors from across the North East. A lengthy round one, over a course designed by Dougherty, kept spectators on their edge of their seats wondering which 12 riders would move on to the second round. The best dozen all had round one scores of 79.75 or higher so the next round was anybody’s game. Fifth in the order DiGuglielmo set the tone for the afternoon when she sailed to a crisp 83, the round’s high score, for a total of 163.5 for the lead but there were seven riders waiting for their turn to top that. The next entry, Gigi Moynihan riding Vanquish, owned by Kendra Harnch, navigated her way to double scores of 81, for a total of 162, to sit just behind the leader. The next three in the order had trouble on the course but the tenth entry showed them how it’s done. 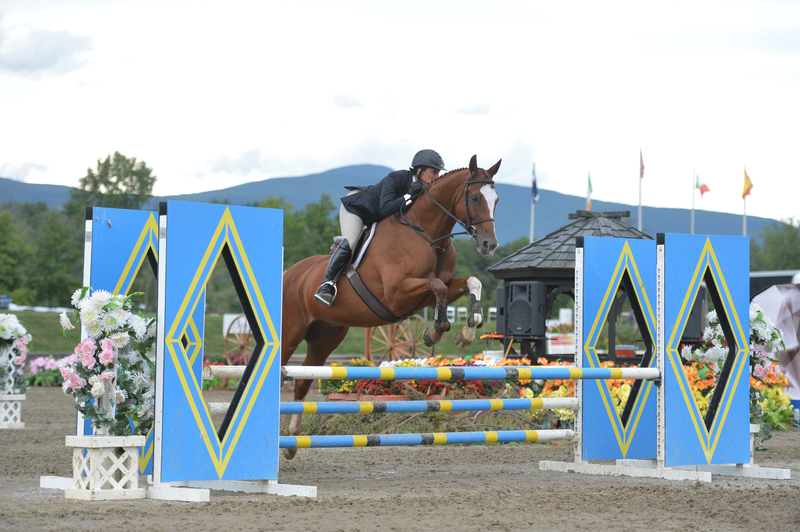 Lauren Reid and Vincent D, owned by MiraBella’s Gold Corp, finished with a second round score of 80, which added to a first round 82.5 gave her a total of 162.5 for second place and bumping Moynihan to third. Sophee Steckbeck and her own Clooney rode to a fourth place finish and Nina Mazella piloting her own Rey Momo finished in fifth place. Francesca DiGuglielmo and Coolidge are presented with the Sore No-More Children’s Medal Final - Horse blue ribbon and trophy. The final class of the weekend, the Marshall & Sterling Adult Medal Final, was the perfect sendoff after a week of memorable competition. Tracie Schoelen and her own Redford rode to an unforgettable win with scores of 85 and 88 for a total of 173 to take home the blue ribbon and until next year, bragging rights. Thirty-one riders took their turn over the 11 fence course designed by Dougherty but only the top twelve would see the light of round two. Competition grew fierce when the sixth entry of round two, Miranda Lekacos and Atlantis, owned by Armand Chenelle, received a score of 84, which totaled 165 when added to their earlier earned 81 for the lead. Lekacos sat pretty at the top for the next few trips but when Schoelen appeared at the in gate, she meant business. Directing her mount to a round one score of 85 it was no surprise when she received a round two score of 88 for a total of 173 to move into the top spot. Caroline Becker, who received a solid 86 in round one, was next in the order and she steered Scottsdale, owned by Little Pine Farm LLC, to a score of 85 for a total of 171 and the second place spot for the moment. Last in the round two order, Britta Lippert guided her own Archie to a score of 85.5. When added to the round one high score of 87, they would finish with a total of 172.5 for second place, pushing Becker to third and Lekacos to fourth. Madison Strony and her own Aye Spy received finished in fifth place. Tracie Schoelen and Redford riding to their Marshall & Sterling Adult Medal Final win. Raina Swani and Patchwork Blueberry were named the Children’s Working Hunter – Pony Small Champion after placing first and third over fences and fourth in the Under Saddle. Reserve was awarded to Blythe Novick and Clovermeade Brilliantly Bunny, placing third and first over fences. The Children’s Working Hunter – Pony Medium Champion was Anna Donovan and Morton Best Man who placed first over fences and fourth in the Under Saddle. Lucas Mejia Fanjul and Champlaine Celebration received Reserve after placing first over fences. Miss Amazing piloted by Isha Swani were named Children’s Working Hunter – Pony Large Champion after placing third and first over fences. Reserve was awarded to Stella Propp and Cherrybrook Skye Blue and Paige Moose and Artwork. Sophee Steckbeck and Clooney were the Children’s Working Hunter – Horse Champion after placing first over fences and second in the Under Saddle. Reserve was awarded to Francesca DiGuglielmo and Coolidge who placed first over fences. 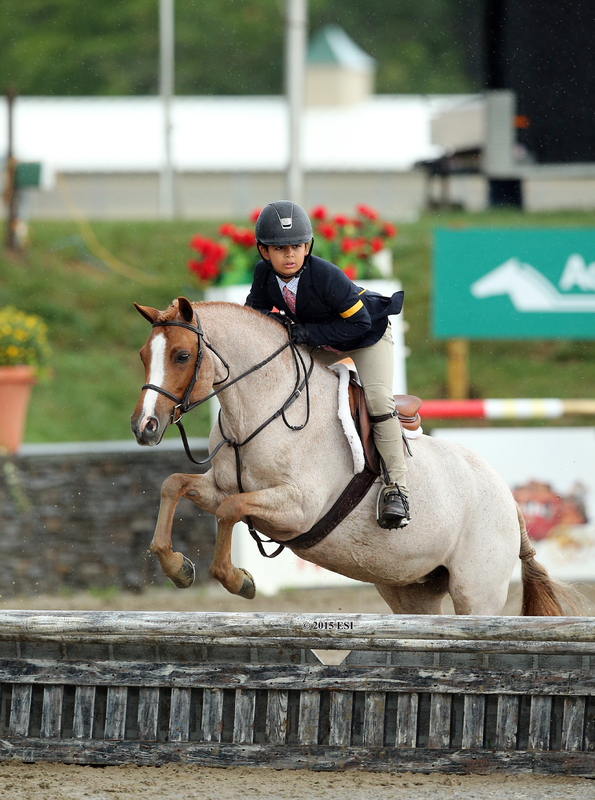 Sophee Steckbeck and her own Clooney were named Best Junior Rider – Horse. The Clarksburg, New Jersey resident trains with Barbara Feigus. 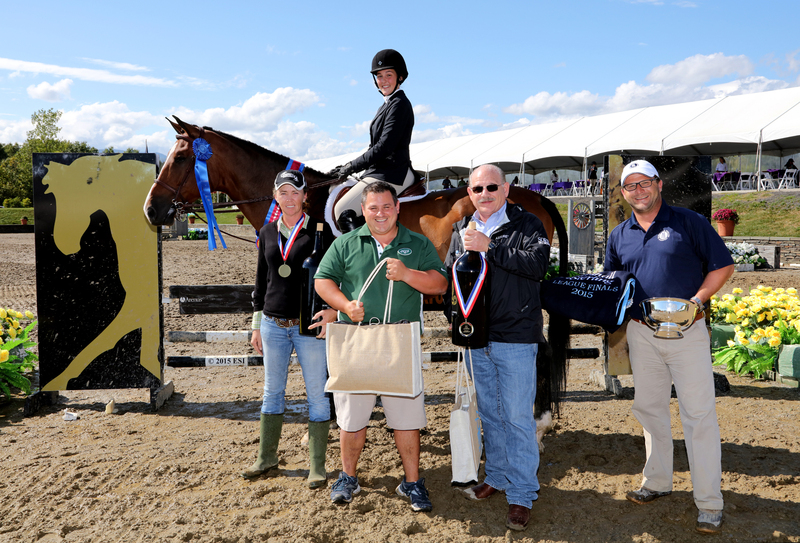 The Best Adult Rider award was presented to Jayme Shapiro of Irvington, New York, and Donald Stewart’s Mr. Coffee. Shapiro trains with Sarah Friedman. Lucas Mejia Fanjul and Champlaine Celebration, owned by Lauren Reid, won Best Junior Rider – Pony. Fanjul trains with Jenni Martin-Rudaz. 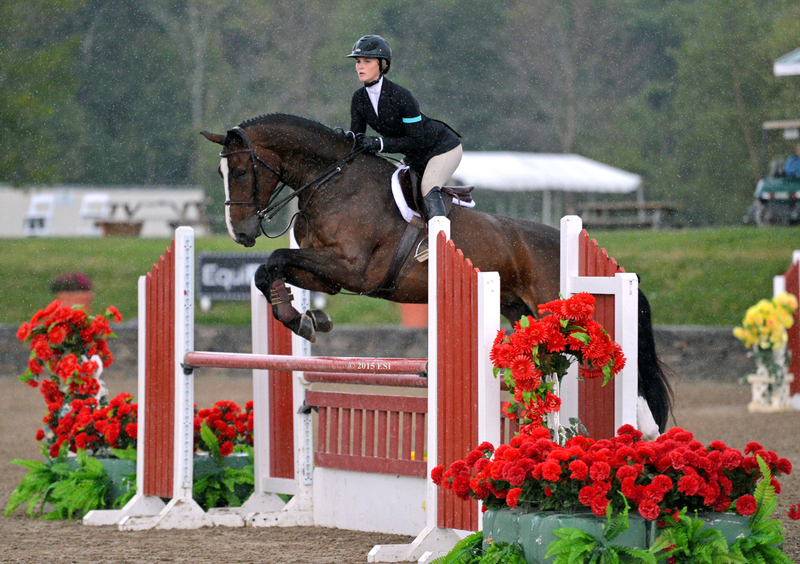 HITS, Inc. produces high-quality, international-level hunter/jumper horse shows. Based in upstate New York in the Village of Saugerties, HITS has been producing shows since 1982 and is now a nationwide company with world-class circuits in California, Florida, Arizona, New York, and Virginia. While hosting the richest weekend in show jumping at HITS-on-the-Hudson, HITS also formed the Triple Crown of Show Jumping. This includes the AIG $1 Million Grand Prix, presented by MortgageCall, in Thermal, California, the Great American $1 Million Grand Prix in Ocala, Florida and Canadian Pacific $1 Million Grand Prix FEI CSI-5*, presented by Wells Fargo, in Saugerties, New York. For more information and a complete schedule of classes and events, visit www.HitsShows.com. Stay connected with HITS! Join us on Facebook and follow us on Twitter and Instagram. Media should contact the HITS Media Team at 845.246.8833 or e-mail media_info@HitsShows.com.